What is the Chorus Effect? Chorus effect is created by the time delay device and frequency modulator.BBD(Bucket Brigade Device) can delay the signal and 'Rate' and 'Depth' knobs can modurate chorus effect.Using chorus effect could creat the vibration effect as well as 12 string effect. 'Rate' knob is the speed controller that modulate the time delay. 'Depth' knob modulates the requency width. 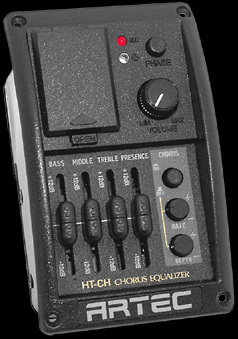 HT-CH is a 4 band Equalizer (Bass, Middle, Treble and Presence) with Chorus effect onboard with 'Depth' and 'Rate' controllers. It enables you to create your guitar sounds sweeten and widen. Once you turn the Chorus switch on, you will experience a totally different acoustic atmosphere from any other equalizer system could provide. Control the 'DEPTH' and 'RATE' knobs together to establish an exquisite piece of guitar sounds for your performance. 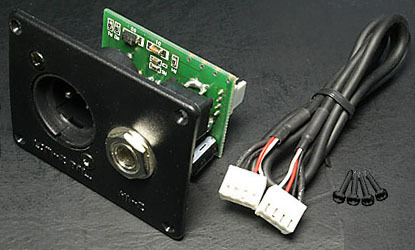 Unbalanced Output Jack:1/4" Phone Jack with power sw.
To enable the Phantom Power feature, a circut board which is mounted , includes a standard 1/4" input jack and XLR jack. This provides for easy installation on the lower bout of your guitar.. This also gives you the option of using a XLR or 1/4" input jack. 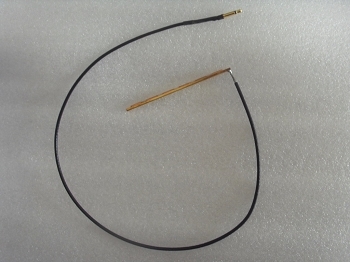 1pcs of Balanced XLR jack. Note:Battery is not inclued because forwarder do not ship battery.